Are you looking for a cheap Baltimore Airport car rental? Baltimore-Washington International Thurgood Marshall Airport serves the metropolitan area of Baltimore-Washington. Also known as BWI Marshall or simply BWI, the airport got its name from a Baltimore native named Thurgood Marshall. He was the country's first African American associate justice. He served between 1967 and 1991. Baltimore-Washington International Thurgood Marshall Airport currently has five concourses: Concourses A and B (26 gates), Concourse C (14 gates), Concourse D (38 gates), Concourse E (6 gates), and the Cargo Concourse. In 2013, BWI Airport launched a $125 million project with the help of Maryland Aviation Administration for the modernization and improvement of the concourses. Aviation.com ranked BWI Marshall number one on its list of the Top 10 Easiest U.S. Airports to Get to in 2007. The main terminal has a light rail station and there are several ground transportation options at the airport. Most people prefer a BWI Airport car rental because it is more convenient than hiring a taxi or riding a bus. Instead of going to the rental car facility, you can easily book a car rental Baltimore Airport through VroomVroomVroom. Our car rental experts have chosen the best Baltimore airport car rental deals so you are assured of getting the cheapest rates and high quality vehicles. Compare BWI Airport car rental deals now and book early to avail of fantastic discounts and special promos! 2. No credit card required for initial booking. 3. Easy and fast booking process. 4. Get booking confirmation number in an instant. 5. Friendly customer care representatives are always ready to give a helping hand. 6. Cheap car rental rates and you can see our price promise here. Baltimore-Washington International Thurgood Marshall Airport does not have any rental car terminal within the airport, but it opened a rental car facility nearby to accommodate their passengers. The BWI Marshall Car Rental Facility is situated along New Ridge Road and Stoney Run Road. There's a free shuttle service that transports passengers to and from BWI approximately every ten minutes. The distance from the airport to the rental car facility is around ten minutes. The shuttle service can be found at the lower level terminal. The drop off and pick up is at the Car Rental Facility so make sure to remember how to get there when returning the vehicle. It is advisable to contact any of the car rental companies at the Car Rental Facility to check the availability and prices of the vehicles. I'm sure you don't want to end up paying more for a BWI Airport car rental just because that's the only vehicle available at the facility. For more choices, it is best to book a Baltimore Airport car rental at VroomVroomVroom. We guarantee the cheapest rates in car rentals and we don't charge any booking or cancellation fees. After following the simple booking process, all you have to do is pick up your car once you arrive at the airport. If there are any changes in time or other details, you can contact our friendly customer service team to assist you. President Harry Truman dedicated the Friendship International Airport on June 24, 1950. It stands on the former site of the Friendship Methodist Church in Anne Arundel County. The new airport started accommodating the airlines from Baltimore Municipal Airport. The Friendship International Airport was purchased by the State of Maryland in 1972. Since then, the operation of the airfield was managed by the Maryland State Aviation Administration. The number of employees increased from three to 200 during that time. The Secretary of Transportation, Harry Hughes, announced the upgrade and modernization of the airport facilities almost immediately after the airport was turned over to the MSAA. In 1973, the name of the airport was changed from Friendship International Airport to Baltimore-Washington International Airport to attract more passengers. The modernization of the BWI was partially finished in 1974, which included better runway systems, more improved landing capabilities, expanded freight capacity, and addition of three air cargo terminals. In 1980, the BWI Railway Station was established and it allowed passengers to have direct link to the Northeast Corridor via Amtrak. It became the first airport in the country to have direct access to an intercity rail station. Southwest Airlines started to offer flights at the Baltimore-Washington International Airport in 1993. This new addition turned the airport into a haven for low cost flights in the metropolitan area of Baltimore-Washington. Concourses A and B were renovated and expanded in 2005 to accommodate the extensive presence of Southwest Airlines. The BWI Airport had an increase of about 6% in passengers in 2009 due to the low-cost flights. Based on a survey conducted by the Airports Council International, the Baltimore-Washington Airport ranked number one in the 15 to 20 million passenger category during the same year. 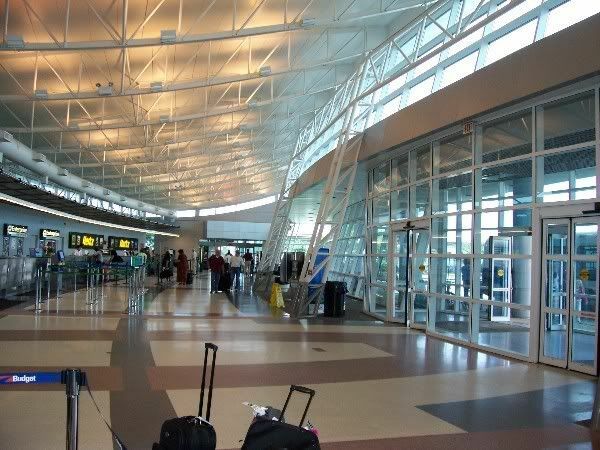 The BWI Airport has also been featured in various Hollywood films including “Goldfinger”, “Twelve Monkeys”, and “The Silence of the Lambs”. Alamo Balt Washington Intl Apt - 7434 New Ridge Rd, Hanover, . Avis Baltimore-washington Intl Airport - 7432 New Ridge Road, Hanover, . Avis Glen Burnie, Md - 7145 Ritchie Highway, Glen Burnie, . Budget Baltimore Washington Intl Apo - 7426 New Ridge Road, Baltimore/Washington, Hanover, . Budget Glen Burnie - 7145 Ritchie Highway, Glen Burnie, . Enterprise Balt Washington Intl Apt - 7426 New Ridge Rd, Hanover, . Enterprise Glen Burnie Central - 500 Crain Hwy N, Glen Burnie, . Enterprise Glen Burnie - North - 6815 Ritchie Hwy, Glen Burnie, . Dollar BALTIMORE - WASHINGTON INTENATIONAL AIRPORT, MARYLAND - 7410 NEW RIDGE ROAD BALTIMORE-WASHINGTON INTL AP, HANOVER, . Thrifty BALTIMORE - WASHINGTON INTERNATIONAL AIRPORT, MARYLAND - 7410 NEW RIDGE RD BALTIMORE-WASHINGTON INTL APO, HANOVER, . Hertz Bwi-thurgood Marshall Ap - 7416 New Ridge Road, Baltimore, . National Balt Washington Intl Apt - 7434 New Ridge Rd, Hanover, . Feedback: Great service on the booking side.